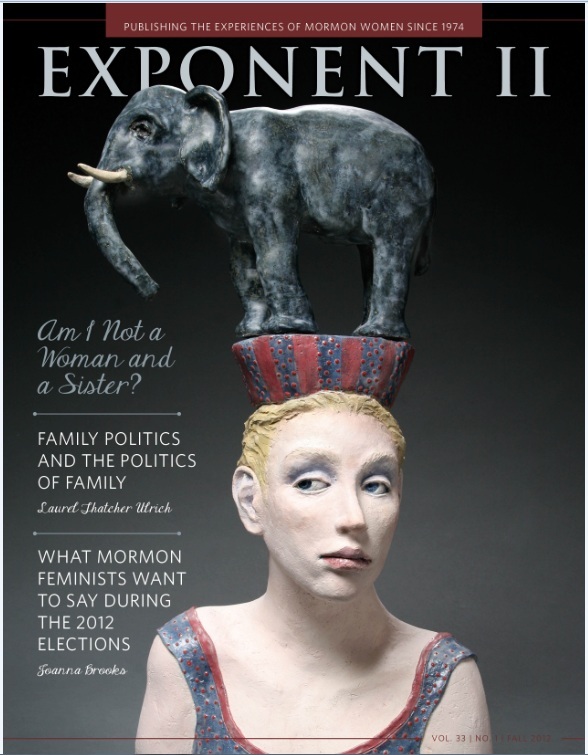 The Exponent Gets Political: Will We Ever be Able to Talk Politics at Church? I don’t consider myself a political person. I have strong opinions about some political matters and I vote, but other than that I stay away from political involvement. I think this is because I’m pretty conflict avoidant. I once volunteered to make a few phone calls encouraging Ohio voters to cast their ballot for John Kerry, but as soon as I contacted someone who yelled at me I couldn’t do it anymore. It was the last political phone call I made. My most visible political act was to march in a protest of the war against Iraq, but that was easy because it didn’t require any direct interaction with the other side. Either because of my personality or my religious training (Agree with thine adversary quickly, while thou art in the way with him, and Blessed are the peacemakers…), I change the subject as quickly as I can if I detect political dissonance with others. But although I’m conflict avoidant, I do, as I said, have strong opinions, and hearing political discourse I disagree with can really agitate me. As a result, I’m quite protective of church as a politics-free zone. I go to church with the hope of enlightenment, and I can’t experience that if my head and heart are pounding because of an inflammatory political comment. Here is an example of that protectiveness. The Sunday after the Supreme Court decided that Florida’s electoral votes in the 2000 presidential election would go to George W. Bush happened to be a Fast Sunday. About halfway through fast and testimony meeting, during which I sat on my hands and chanted silent pleas that no one would say anything political, a man got up and said something about how at his workplace everyone has more liberal political views than him and he’s tired of it and he’s glad that finally truth and righteousness have prevailed in the executive office of our blessed country. It was basically a victory speech for Bush, and I was livid. Partly because I was disappointed that Bush would be president and this guy was rubbing it in, and partly because my ideal of a politics-free church had been violated. So with blood forcing adrenaline from my gut to my extremities I marched up to the pulpit, not knowing what I was going to say. With the kind of quiet voice used when one is afraid of one’s own anger, I said that as members of the Church we may sometimes feel alone in society – at work, or in other places. We may feel isolated in our views. That is hard. But it’s also hard to feel alone at church. My political views are different from many of yours, and that is hard for me. So can we please leave politics outside? No one said anything political in sacrament meeting for the remaining few months I was in that ward, and the guy from testimony meeting moved to a red state where I imagine he is much happier. Thankfully, I can’t recall ever hearing anything overtly political in my current ward’s meetings; I think people recognize we have a diversity of political views and no one wants to set another person’s teeth on edge. So I should be happy about that. And I am. I hope the trend continues through this year’s presidential election. Except that sometimes I wonder if we could do better than maintaining a nervous silence around anything that touches on politics and government. Because folks at church are? hyper-aware of the large numerical imbalance of political party members among Mormons, I think the Democrats stay silent for fear of seeming like sanctimonious left-wing loudmouths and the Republicans stay silent for fear of seeming overbearing and intolerant. So nobody really knows the reasons behind another person’s views. If the ultimate ideal is to peaceably agree with one another surely a first step is understanding. This means that when someone mentions a political issue in a church setting I need to be able to say something more useful than “Shut up! You can’t talk about that at church!” We have to listen to each other. And that means we have to give each other permission to speak. Yet even as I write that I’m wincing a little because I know how an offhand political comment can zap the spirit out of a worship service when it falls on the wrong ears. I do not think politics belong in our Sunday meetings – we have more than enough to fill the time with learning the gospel together. But we Mormons spend a lot of time together outside of Sunday meetings at activities, service projects, and informal social gatherings. Is it possible and appropriate to have political conversations in these kinds of situations? I think it is, if we have the right expectations. The first should be to hear, not to be heard. The second must be that we don’t attempt to make converts to our point of view. The third is to not judge. No one likes having another person’s opinion foisted on them, particularly if it’s one they find objectionable. But people do like being asked what they think. What if we asked each other, with honest interest, for thoughts on current issues touching politics and government? What if we refrained from offering our political opinions until asked for them? What if we put aside the Mormon impulse to convert people to the truth and respected another’s right to maintain their political views (no matter how wrong they are!). What if we stopped inventing reasons for why people think what they think and instead just asked them about their reasons? What if we stopped judging others as foolish, misled, elitist, heartless, or worse, because of their political views? What good could come of this? It certainly will not make everyone agree with each other, and that is all right. Diversity is natural and good. But it might bring better understanding, and with that hopefully more tolerance, sensitivity, and comfort in the company of people unlike ourselves. Perhaps the reason I was so uncomfortable making political phone calls is because I wasn’t calling to understand, only to persuade, and perhaps that felt wrong because it is wrong to attempt to change another person’s views without first understanding them. Our current political environment is so polarized, caustic, and ravenous for the swing vote that it’s only right to keep spirit-zapping political talk out of church. Yet, we need more agreement, more peace in our politics, and for that we need understanding. Let it begin with me. 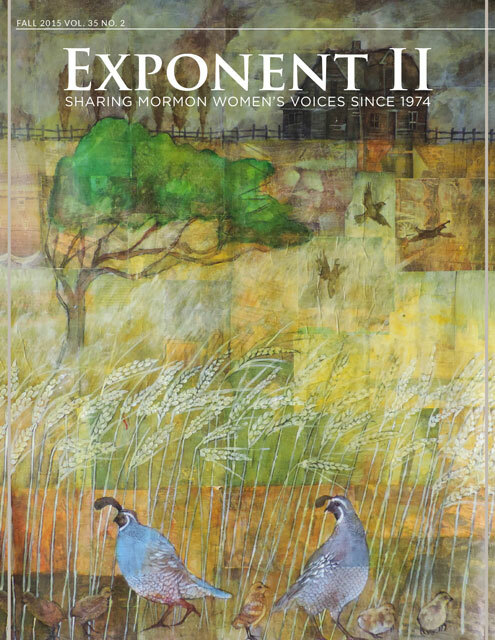 This series includes submissions for Exponent II’s Fall 2012 issue. Don’t forget to purchase your subscription or individual copy of the magazine by October 15th to be sure you’ll get a copy. I’m with you — I don’t want people mentioning politics in a “thou shalt or thou art condemned” way at church, but I want to feel as free to discuss issues with my Mormon friends as I do with my non-Mormon friends. I don’t think it is practical (or even desirable) to completely eliminate political speech at church, but the spirit of strife and contention must be diligently avoided. I really like the policy of the church in not endorsing specific candidates for political office, but I can also understand how folks “let their hair down” on occasion and grumble about various politicians and policies at church. That is an eminently normal thing to do among friends and I think is generally okay. However, I think we need to charitably leave plenty of room for others to disagree and be disagreeable. I cherish the account in Moses 7:26-41 of Enoch’s vision of the people who lived before the Flood and how tenderly God loves even the wicked. We are all precious children of His. Take care. Emily, this was a remarkable post. Thank you. It also reminded me of something I read just today about the Council of the Fifty set up in Nauvoo under Joseph Smith. They were to be the governing body for God’s Kingdom on the earth and were given a small constitution, but nine rules. The fifth of those rules was that every person got to speak and/or vote, in order. Meaning that all others got to listen, when they were not speaking or voting. And, more interestingly (and surprisingly), they had to voice their dissenting views, if they had any. They had to do this by covenant. Before anything was decided, they had to be unanimous, but they wanted it to be real unanimity. Not a fake one. I bring this up not to say that we as members of the LDS church need to agree with one another politically, because I do not believe that. But, I do believe that we each need our turn to speak and to listen, and that it could be good for us to speak honestly and humbly about our differences as well, and our reasons for them. That’s a fascinating story about the Council of the Fifty. Thanks for sharing it! I’m not going to say that I’m comfortable with the idea that politics and church should be discussed at meetings, especially, given that some people will naturally be inclined to make statements such as”your spirit is not in tune with God,” if you don’t vote a specific way on any given topic. I’m really interested in what is going to happen when/and or if Romney gets elected and people go for their temple recommend issue and they say they don’t support him as a leader. Why would that happen? If elected, Romney would in no way be representing them as an ecclesiastical leader. So whether one supports or opposes Romney has no bearing on the outcome of a temple recommend interview. This morning I happened to run across these words of Christ in my reading: “He that hath the spirit of contention is not of me, but is of the devil, who is the father of contention, and he stirreth up the hearts of men to contend with anger, one with another. Behold, this is not my doctrine, to stir up the hearts of men with anger, one against another; but this is my doctrine, that such things should be done away” (3 Nephi 11:29-30). Emily, I have often shared your feelings while sitting in church. I, too, am reluctant to share my strong opinions until asked, and even then I am reluctant because I am acutely aware of how easily such conversations can become contentious. I really appreciate your suggestion that we engage in more discussions of politics with the intent to hear rather than to be heard. Thank you, NCTH, for the reminders to us found in 3 Ne 11:29-30. I recently attended the Republican First Ward (my parents’ ward in St George, Utah). Sunday School was especially partisan. Although many pointed comments were prefaced with “this isn’t a political,” the comments about The Importance of this Election (in the context of talking about Pahoran and Kishkumen in the Book of Mormon) were very thinly-veiled endorsements of Romney and/or slams on Obama. The irony of endorsing someone who apparently hasn’t fully internalized Mosiah 4:16-19 seemed lost on those in attendance.